The circular economy has become, for many governments, institutions, companies, and environmental organisations, one of the main components of a plan to lower carbon emissions. In the circular economy, resources would be continually re-used, meaning that there would be no more mining activity or waste production. The stress is on recycling, made possible by designing products so that they can easily be taken apart. Attention is also paid to developing an “alternative consumer culture”. In the circular economy, we would no longer own products, but would loan them. For example, a customer could pay not for lighting devices but for light, while the company remains the owner of the lighting devices and pays the electricity bill. A product thus becomes a service, which is believed to encourage businesses to improve the lifespan and recyclability of their products. The circular economy is presented as an alternative to the “linear economy” – a term that was coined by the proponents of circularity, and which refers to the fact that industrial societies turn valuable resources into waste. However, while there’s no doubt that the current industrial model is unsustainable, the question is how different to so-called circular economy would be. Several scientific studies (see references) describe the concept as an “idealised vision”, a “mix of various ideas from different domains”, or a “vague idea based on pseudo-scientific concepts”. There’s three main points of criticism, which we discuss below. The first dent in the credibility of the circular economy is the fact that the recycling process of modern products is far from 100% efficient. A circular economy is nothing new. In the middle ages, old clothes were turned into paper, food waste was fed to chickens or pigs, and new buildings were made from the remains of old buildings. The difference between then and now is the resources used. Before industrialisation, almost everything was made from materials that were either decomposable – like wood, reeds, or hemp – or easy to recycle or re-use – like iron and bricks. Modern products are composed of a much wider diversity of (new) materials, which are mostly not decomposable and are also not easily recycled. For example, a recent study of the modular Fairphone 2 – a smartphone designed to be recyclable and have a longer lifespan – shows that the use of synthetic materials, microchips, and batteries makes closing the circle impossible. 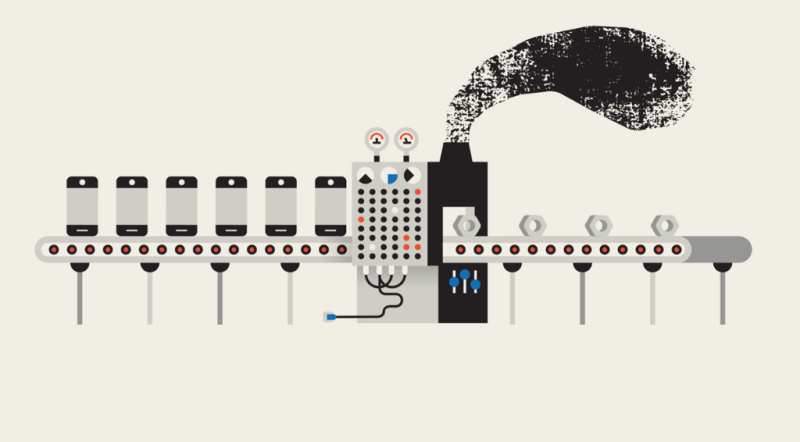 Only 30% of the materials used in the Fairphone 2 can be recuperated. A study of LED lights had a similar result. The large-scale use of synthetic materials, microchips, and batteries makes closing the circle impossible. The more complex a product, the more steps and processes it takes to recycle. In each step of this process, resources and energy are lost. Furthermore, in the case of electronic products, the production process itself is much more resource-intensive than the extraction of the raw materials, meaning that recycling the end product can only recuperate a fraction of the input. And while some plastics are indeed being recycled, this process only produces inferior materials (“downcycling”) that enter the waste stream soon afterwards. The low efficiency of the recycling process is, on its own, enough to take the ground from under the concept of the circular economy: the loss of resources during the recycling process always needs to be compensated with more over-extraction of the planet’s resources. Recycling processes will improve, but recycling is always a trade-off between maximum material recovery and minimum energy use. And that brings us to the next point. How can you recycle energy sources? The second dent in the credibility of the circular economy is the fact that 20% of total resources used worldwide are fossil fuels. More than 98% of that is burnt as a source of energy and can’t be re-used or recycled. At best, the excess heat from, for example, the generation of electricity, can be used to replace other heat sources. As energy is transferred or transformed, its quality diminishes (second law of thermodynamics). For example, it’s impossible to operate one car or one power plant with the excess heat from another. Consequently, there will always be a need to mine new fossil fuels. Besides, recycling materials also requires energy, both through the recycling process and the transportation of recycled and to-be-recycled materials. To this, the supporters of the circular economy have a response: we will shift to 100% renewable energy. But this doesn’t make the circle round: to build and maintain renewable energy plants and accompanied infrastructures, we also need resources (both energy and materials). What’s more, technology to harvest and store renewable energy relies on difficult-to-recycle materials. That’s why solar panels, wind turbines and lithium-ion batteries are not recycled, but landfilled or incinerated. The third dent in the credibility of the circular economy is the biggest: the global resource use – both energetic and material – keeps increasing year by year. The use of resources grew by 1400% in the last century: from 7 gigatonnes (Gt) in 1900 to 62 Gt in 2005 and 78 Gt in 2010. That’s an average growth of about 3% per year – more than double the rate of population growth. Growth makes a circular economy impossible, even if all raw materials were recycled and all recycling was 100% efficient. The amount of used material that can be recycled will always be smaller than the material needed for growth. To compensate for that, we have to continuously extract more resources. Growth makes a circular economy impossible, even if all raw materials were recycled and all recycling was 100% efficient. The difference between demand and supply is bigger than you might think. If we look at the whole life cycle of resources, then it becomes clear that proponents for a circular economy only focus on a very small part of the whole system, and thereby misunderstand the way it operates. A considerable segment of all resources – about a third of the total – are neither recycled, nor incinerated or dumped: they are accumulated in buildings, infrastructure, and consumer goods. In 2005, 62 Gt of resources were used globally. After subtracting energy sources (fossil fuels and biomass) and waste from the mining sector, the remaining 30 Gt were used to make material goods. Of these, 4 Gt was used to make products that last for less than one year (disposable products). The other 26 Gt was accumulated in buildings, infrastructure, and consumer goods that last for more than a year. In the same year, 9 Gt of all surplus resources were disposed of, meaning that the “stocks” of material capital grew by 17 Gt in 2005. In comparison: the total waste that could be recycled in 2005 was only 13 Gt (4 Gt disposable products and 9 Gt surplus resources), of which only a third (4 Gt) can be effectively recycled. About a third of all resources are neither recycled, nor incinerated or dumped: they are accumulated in buildings, infrastructure, and consumer goods. Only 9 Gt is then put in a landfill, incinerated, or dumped – and it is this 9 Gt that the circular economy focuses on. But even if that was all recycled, and if the recycling processes were 100% efficient, the circle would still not be closed: 63 Gt in raw materials and 30 Gt in material products would still be needed. As long as we keep accumulating raw materials, the closing of the material life cycle remains an illusion, even for materials that are, in principle, recyclable. For example, recycled metals can only supply 36% of the yearly demand for new metal, even if metal has relatively high recycling capacity, at about 70%. We still use more raw materials in the system than can be made available through recycling – and so there are simply not enough recyclable raw materials to put a stop to the continuously expanding extractive economy. A more responsible use of resources is of course an excellent idea. But to achieve that, recycling and re-use alone aren’t enough. Since 71% of all resources cannot be recycled or re-used (44% of which are energy sources and 27% of which are added to existing stocks), you can only really get better numbers by reducing total use. A circular economy would therefore demand that we use less fossil fuels (which isn’t the same as using more renewable energy), and that we accumulate less raw materials in commodities. Most importantly, we need to make less stuff: fewer cars, fewer microchips, fewer buildings. This would result in a double profit: we would need less resources, while the supply of discarded materials available for re-use and recycling would keep growing for many years to come. It seems unlikely that the proponents of the circular economy would accept these additional conditions. The concept of the circular economy is intended to align sustainability with economic growth – in other words, more cars, more microchips, more buildings. For example, the European Union states that the circular economy will “foster sustainable economic growth”. Even the limited goals of the circular economy – total recycling of a fraction of resources – demands an extra condition that proponents probably won’t agree with: that everything is once again made with wood and simple metals, without using synthetic materials, semi-conductors, lithium-ion batteries or composite materials. This article first appeared on Low-tech Magazine. Kris De Decker is editor of Low-Tech Magazine and lives in Barcelona, Spain. Haas, Willi, et al. “How circular is the global economy? : An assessment of material flows, waste production, and recycling in the European Union and the world in 2005.” Journal of Industrial Ecology 19.5 (2015): 765-777. Murray, Alan, Keith Skene, and Kathryn Haynes. “The circular economy: An interdisciplinary exploration of the concept and application in a global context.” Journal of Business Ethics 140.3 (2017): 369-380. Gregson, Nicky, et al. “Interrogating the circular economy: the moral economy of resource recovery in the EU.” Economy and Society 44.2 (2015): 218-243. Krausmann, Fridolin, et al. “Global socioeconomic material stocks rise 23-fold over the 20th century and require half of annual resource use.” Proceedings of the National Academy of Sciences (2017): 201613773. Korhonen, Jouni, Antero Honkasalo, and Jyri Seppälä. “Circular economy: the concept and its limitations.” Ecological economics 143 (2018): 37-46. Fellner, Johann, et al. “Present potentials and limitations of a circular economy with respect to primary raw material demand.” Journal of Industrial Ecology 21.3 (2017): 494-496. Reuter, M. A., and A. Van Schaik. “Product-Centric Simulation-based design for recycling: case of LED lamp recycling.” Journal of Sustainable Metallurgy 1.1 (2015): 4-28. Reuter, Markus A., Antoinette van Schaik, and Johannes Gediga. “Simulation-based design for resource efficiency of metal production and recycling systems: Cases-copper production and recycling, e-waste (LED lamps) and nickel pig iron.” The International Journal of Life Cycle Assessment 20.5 (2015): 671-693.